What is legend tripping? Legend tripping is an impromptu journey to a location that is reputed to be haunted or well known for paranormal activity. This page does not represent documentation of straight and thorough investigations, it is more a casual collection of interesting places where others, past and present, have reported unusual activity. Remember! If you should seek out and visit any of these places yourself, SHOW THE LAND AND STRUCTURES THE RESPECT THEY DESERVE! Many of these spots have a place in our history and are a part of who we are and where we have been as a people. There have been many places made non-accessible to all because of the thoughtless behavior of a few. If you have had a personal experience at any of these sites, or have heard a good story about someone else who has, please let us know at our Guest Book page, or by e-mailing us at: greenvillepr@yahoo.com. The remains of Hanton City are scattered about in three hundred acres of rough and rocky woods, just off Rt. 7 in northern Smithfield. It was a Colonial (late 16oo's) village that was made up of mostly leather tanners, woodworkers and stone cutters. By the late 1800's, the settlement was in decline as most people began to move away to find better lives. Sometime after the village was no more, it became known as Haunted City. Most people feel that this is just a play on words (Hanton/haunted) and a reference to the fact it is an abandoned ghost town. Some say the area is in fact haunted by those who lived and worked so hard there amongst the rocks and can't leave even after death. It is believed that native American graves are to be found in these woods and that native spirits are also part of the strange sights and sounds some claim to have experienced over the years. The photograph above shows a place called the "mystery site". It is called this because the name of the family who lived there is not known. identified sites in Hanton City. Cellar hole of the Brown's home. The pile of stones up top are what is left of the chimney. This is the location of the brutal murders of Hannah Franke and her fiance' John Burke. On September 18, 1831, the two were ambushed here while traveling to John's home in Vermont. Their attackers were Hannah's former employers, the Warmsley brothers. Like Hannah, they were Nipmuc (native American) and not too happy about her leaving them for the love of a white man and the prospect of a better life up north. People have heard and seen Hannah close to this spot moving about the woods calling for justice. Some feel she is looking for a shell necklace, lost during the assault, that John gave her early in their courtship. The two lovers were buried nearby (in a spot that is now private land), so she may want the necklace with her in their final resting place. The simple graves of the two tragic lovers Hannah Franke and John Burke. This family cemetery has no state sign, nor does it have any grave markers. All that can be seen is a crumbling retaining wall and the base for a grave stone that is long gone. It is believed that one of the four known members of the Sherman family interred here, Laura, is upset about the poor condition of the plot. She has been seen near the intersection of Wakefield Rd. and Croff Rd., running about as if she is trying to get the attention of people driving by. There are also tales about her approaching people camping in the woods and wanting them to follow her, as if there is something very important she wants them to see. There are many roads and byways throughout the world that have a reputation for being a paranormal hot spot. In little Rhode Island, it is Tower Hill Road. It winds its way through the woods and rock formations between Diamond Hill Rd. and Wrentham Rd. Ghosts of children, strange lights and even walking dead have been reported over the years up and down the road. *UPDATE: Greenville Paranormal Research has learned about two sightings of what paranormal researcher, Nick Redfern, would call a "Man Monkey". One sighting took place in the late 1970s and the other was in 2003. A total of five people have seen this creature. Cumberland, RI doesn't seem to be a likely home for Big Foot, but the Man Monkey is believed to be something else, a creature that can jump dimensions. With all the ghost stories and tales of phantom lights, along with all the quartz and iron in the area, it would seem that Tower Hill maybe subject to some kind of riff. In the woods behind the Cumberland Public Library (the former Monastery) stands this small but poignant monument to nine militia men killed during the King Philip's War. 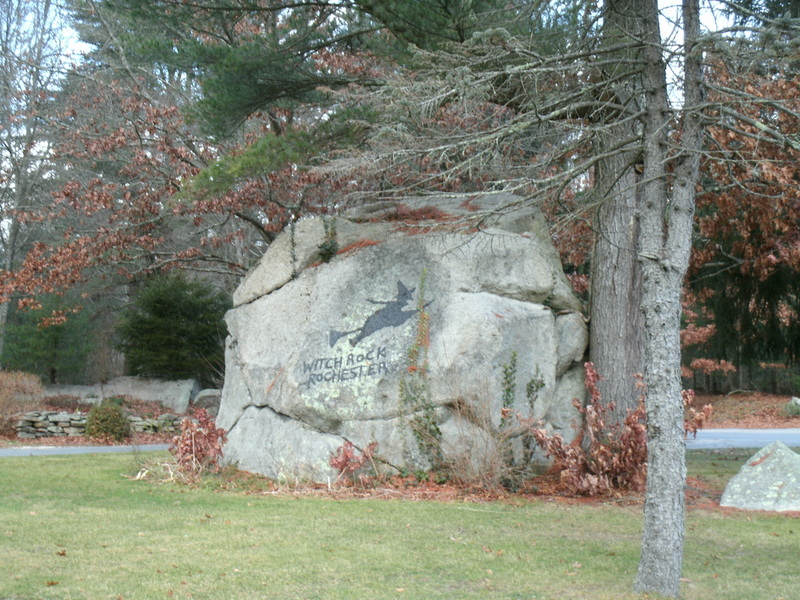 A band of native American warriors were tracked to this area by Captain Pierce and his party on March 26, 1676, after they had raided Warwick and Providence. The white soldiers were overrun and while in retreat, nine of their men were taken prisoner (ten originally, but one escaped) and then killed. When found some time latter, their remains were buried at this spot. Many people claim to have heard the soldiers' tortured screams while at this monument. Sounds of horses and glimpses of forms moving about the woods have been reported as well. The ghost of an unidentified little girl has also been seen by people taking walks on the public foot paths. The library and its grounds are said to be haunted by monks. A view of the woods from the backside of the monument. Even on a sunny day it feels somewhat dark. If you are looking for an old New England cemetery that will make you feel very uneasy, you will find one on Elder Ballou Meeting House Road in the Ballou District of Cumberland. Its stones and markers cover a small hill in amongst small trees and tight bushes with a row of crypts facing the road along the bottom. The phantom of a gray man has been seen moving about this creepy graveyard. The former Saint Ann's Church is now an arts and cultural center. There seems to be a few ghosts haunting this beautiful building that some feel are the spirits of former parishioners helping to protect their church. Below: The pipe organ has played notes in response to comments made by the center's staff. The Slater Mill Museum is the birthplace of the American Industrial Revolution. It is also very haunted. The Sylvanus Brown House was rescued from demolition and brought to the Slater Mill site in the early 1960s. It would appear that the ghost of a little girl, named Becca, came along with it. She has been seen on two occasions and heard many times laughing and running about the little cottage. Located on Buckeye Brook Road, this small family cemetery has stories connected to it about glowing orbs, voices and human shapes moving around within its thick stone walls. In the mid eighteenth century, a young woman named Hannah Robinson would spend time by this boulder to reflect and enjoy the woods. A sick and heartbroken widow by age 27, she died on October 30, 1773, the day after coming home to receive her father's forgiveness for marrying a man he did not approve of. Her spirit has been seen here in the small park named for her near the intersection of Rt. 1 and Rt. 138. A visit during daytime hours reveals a neat and beautifully kept cemetery with many graves marked by stones of all shapes and sizes. However, people who live in the vicinity say the grounds take on a different vibe at night and claim they have seen strange lights and figures moving about the graves. Left:The memorial and marker for the unidentified bodies that were moved during World War II from Davisville and buried here in order to make room for much needed military facilities. It is possible that the spirits of the disinterred are at unrest because they are confused and upset about this move. Exeter's historic cemetery number 14 is the final resting place for apple farmer Stutley Tillinghast and his family. He lost seven of his fourteen children to tuberculosis (then called consumption) after having a nightmare about losing half his orchard. Sarah, his oldest daughter at 14 years, was the first to pass in 1790. Because the other six siblings spoke of her coming to them at night as they succumb to the disease, Sarah would be blamed for their condition and later become known as one of Rhode Island's vampires. Legend has it that even though she was in the ground longer than the others, when dug up to be dispatched, she was well preserved with fresh blood in her heart. You will find this cemetery right next to the Chestnut Hill Baptist Church on Rt. 102. In it lies the grave of the last Rhode Island vampire, Mercy Brown. She was, like her mother, sister and brother, a victim of tuberculosis. In March of 1892, two months after Mercy had died, a Doctor Metcalf tried to calm the fears of a few folks in Exeter who believed Mercy's brother, Edwin, was being taken by a vampire spirit. In order to find out which one of the deceased Brown women contained the vaporous life-sucker, Mercy's mother (Mary Eliza) and sister (Mary Olive) were dug up. Their bodies showed advanced states of decay, so the vampire hunters were sure it could not be either of them. Mercy's body was being kept in the graveyard's crypt for burial in the spring when the ground thawed, so suspicion next fell on her mortal remains. After opening the crypt, the small crowd discovered her body in an unspoiled condition and her hair and fingernails had also grown. The superstitious pack were sure that they had found their vampire. Mercy's heart was cut out, burned and the ashes were given to Edwin as the cure for the vampire's curse. Edwin Brown died two months later. A friend of Bram Stoker sent him a clipping of the local news paper report on this spooky event and it is believed Stoker took some inspiration from it for his classic book, Dracula. The crypt (or keep) where Mercy Brown's body was kept during the winter of 1892 before Dr. Metcalf treated it for vamperism that March. Ghostly voices and ethereal church services have been reported to emanate from this old meetinghouse. It is in the cemetery that one of the most inaccurate folktales of Rhode Island was given ground. Nineteen year old Nellie Vaughn died on March 1, 1889, after a battle with pneumonia. After a short time in the family plot, she was moved to the cemetery here at Plain Meetinghouse Road out of love and respect from her parents. Her gravestone (now long gone, stolen by vandals) had a very common epitaph for the time, "I am waiting and watching for you. ", meaning the departed will be in heaven waiting for their loved ones when their time comes. Some years ago, her grave was discovered by some misguided youths who mistook her for Mercy Brown. The epitaph seemed to be a spooky warning, not a loving thought. Many people claim they have seen a woman in white by the grave site who appears to be hovering just above the ground. The local police discourage legend tripping at both the meetinghouse and graveyard. Haunted by a number of spirits, the majority of which are believed to be attached to the many period pieces displayed throughout the museum. The most active ghost seems to be a little girl who wants people to play with her. Above:The ghost of a little girl, believed to be named Sarah Elizabeth, was seen crossing this hallway (from right to left) and entering the old classroom. Local historians say the entry door was originally to the right, across from the classroom, not straight on like it can be seen in this picture. Children would have entered the house through that way when classes were held here. Deep in the woods off of Jencks Road, along the Connecticut border, sits the Young family plot. Levi and Anna Young's oldest child, Nancy, became ill with consumption and died on April 6, 1827. She was only nineteen. When her brothers and sisters became ill and began speaking of strange delusional things, such as Nancy coming in the night and speaking to them, Levi Young and his neighbors feared the worst; Nancy was a vampire, draining the life force from her own family. That summer, her grave was dug up and Nancy's remains were set on fire so that the Young family could breathe in the smoke as a cure for the vampire's curse. Their actions failed. The children all died and were buried, one by one, alongside their sister, Nancy. Since then, Nancy Young has gone down in history as one of Rhode Island's vampires. In the woods just off of Moosup Valley Road is the unusual burial plot of Dr. Thomas Carpenter and his second wife Henrietta. The Doctor, who loved to dance and have fun, divorced his first wife. He remarried at the age of fifty to a woman thirty years his junior. Sadly, she died a year later. The Doctor married a third time, but that union too ended in divorce. When he died in 1839 he was laid to rest wearing his favorite dancing shoes and gold watch, which was wound and set to the correct time. He had four massive stone slabs placed around his grave and buried along side him is his young wife, Henrietta. It is said he did this to keep his ex-wives from bothering them in the afterlife, but locals say it was to keep Henrietta from leaving him, should she rise from the grave. This curious sign can be found on Mill Street, not far from the Selee family cemetery. The small patch of woods where the mill once stood is well overgrown and not suitable for hiking. The road is populated with homes and finding a safe spot to park your car for even a short visit is a bit tricky. One can't help but wonder if the "satanic imps" mentioned were the infamous Pukwudgies that are known of in this part of New England. Interestingly enough, G.P.R. was told a story about a man that lives in this area who does not like to go out at night. This town resident told his friends that one evening while driving home he saw some creepy little thing run across the road on two legs. Not far from the above location is the intersection of Bird Road and Winter Street. It was here in 1971 that an off duty police officer encounter a Thunderbird. These huge birds have been seen throughout the Bridgewater Triangle for as long as people have lived in this strange region. It was 2:00 am when officer Downy (yes, that was his real name) encountered a six foot tall black bird standing in the road. It quickly took off and disappeared into the night. 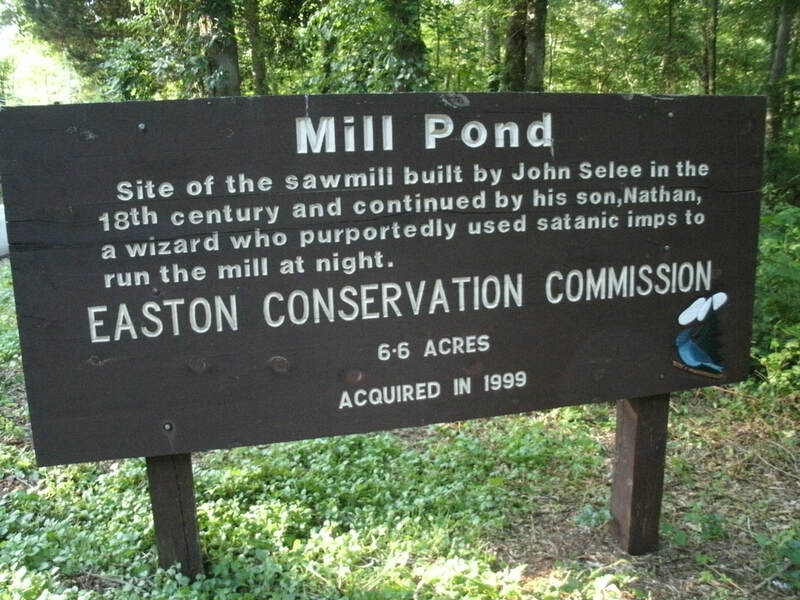 Since the release of the documentary "The Bridgewater Triangle" many more folks have come forward with their amazing sightings of these mysterious creatures. Is this stretch of highway the setting for a modern urban legend or the location of an actual haunting? Many people who live and travel in this corner of the "Bridgewater Triangle" claim to know someone, who knows somebody, who has had an encounter with the Red Headed Hitchhiker. Some accounts say he also has a red beard, but all mention him wearing a plaid shirt. People see him hitching along the side of the road late at night. Most do not stop to offer a ride, but those who have regret doing so. He never talks when picked up and usually vanishes shortly afterwords. People who have avoided picking him up at one spot on the road have seen him again farther along the way. He has stepped out in front of cars, making drivers swerve to avoid him. When they stop to look for him, they find no one. A common detail in many of these stories is a horrible laugh which seems to come from every direction and often out of car radio speakers. Sign at the small parking lot off of Route 44. The rock is about one hundred yards in from the road. Visitors to this historic site have reported seeing phantom campfires, strange lights, moving figures and even shifts in time. Some years ago, a man reported hearing a voice cry out from the swamp in a language that he couldn't understand. This witness claims he was told long after the event that the word he heard was Algonquian for "stand and fight". A view of the haunted swamp from the top of Anawan Rock. Visitors and local residents have reported seeing the ghosts of students and their teacher holding class at this well preserved one room schoolhouse. It is located at the intersection of Hornbine Road and Baker Street. The ghost of a young boy, shadowy figures and bright orbs have been observed by locals moving about this very old graveyard on Lake Street. In 1810 the Palmer River Manufacturing Company was built here on the site of the old Joshua Smith gristmill. They manufactured cotton yarn until 1826, when they expanded and renamed the factory the Orleans Manufacturing Company and began to produce fine cotton cloth. It was destroyed by fire in 1831 and rebuilt one year later. The only stop in production would be during the Civil War, but as soon as the war ended, the company was back in business. Unfortunately, another fire would bring everything to an end in 1884. The mill was then left in ruins. You will find them on Reed Street, right by the Shad Pond. People claim to have witnessed fires in these ruins that seem to vanish as fast as they appeared, with no signs of smoke or burn damage. Orbs of light have also been reported in the woods. A male phantom is reported to move about the old factory site, which is very difficult for an earthly human to do with all the thick overgrowth. No one is sure who he might be. Perhaps he is responsible for the last great fire. Many profess a sense of dread and the need to leave when walking about the ruins. Left:The southwest corner is said to be haunted by an angry man dressed in nineteenth century clothes. He swears at women and calls out the name, Catherine. Cat calls and wolf whistles are also heard coming from the nearby woods that make women feel very uncomfortable and have compelled some to leave the cemetery. A strange cloud has been seen moving about the graves and woods that witnesses say could not have been natural. 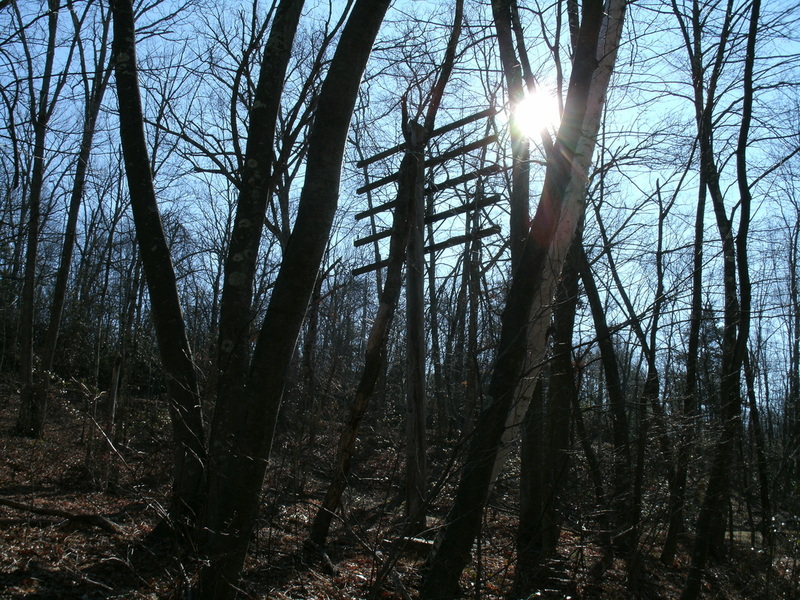 Located at the end of Forest Entry Road, deep in the Freetown State Forest, this disused rock quarry has been the site of many paranormal occurrences. Everything from mysterious lights, ghosts and UFOs have been reported here. Paranormal writer/researcher Christopher Balzano's book, Dark Woods- Cults, Crimes and Paranormal in the Freetown State Forest, is the best source for information on the forest and all its weird happenings. This spot is found in the woods across the road from the Reservation Visitor's Center. A very important meeting spot for the Wampanoag tribe, it has also played host to some very moving encounters with native American ghosts. People visiting the forest have seen strange smoke-like forms and full blown apparitions at this site and at the nearby picnic shelter. **UPDATE: THE USS SALEM IS NO LONGER OPEN. LACK OF FUNDING HAS CLOSED IT DOWN TO THE PUBLIC. ITS FUTURE AS A PUBLIC MUSEUM IS NOT KNOWN. This Des Moines class heavy battle cruiser never fired a shot in anger, but it had many deaths on board during a humanitarian mission to Greece. People have reported seeing shadowy figures and hearing the screams of women. The wardroom is felt to be the most active spot on this warship turned museum. The inn is made up of four buildings, three of which were brought to the property in the early twentieth century. Above: The Captain's House is haunted by a kind lady and two happy little girls. Below Left: The Tavern is haunted by one of the inn's former owners and two musicians who passed away while performing on stage, on two separate occasions. Below Right: The Saltworks House is said to be haunted by the sounds of a small child. For many years now, people have claimed that this cemetery is haunted by apparitions and voices. The best known tales of this location are the reports of phantom bodies seen hanging from the trees in the woods behind the back wall. The woods are also said to be haunted by a ghostly horse and rider. There is an urban legend about a ghost car that races down the road in front of the cemetery as well. Located at the intersection of New Bedford Road and Vaughn Road on private property (someone's front lawn). Women accused of being witches were hung from this rock in the 17th century. One local legend says that when the rock cracked, the ghosts of all the hanged witches flew out. 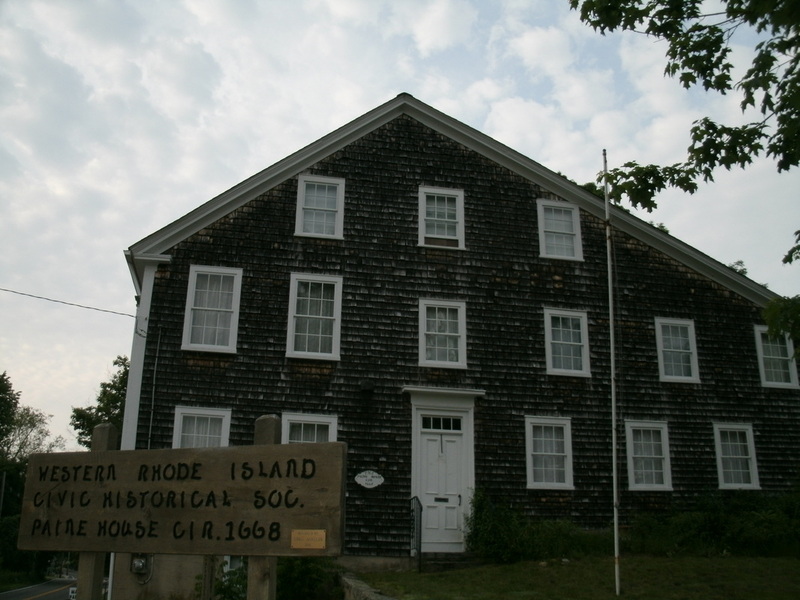 This historic gem is located at 443 Plymouth Street and has stood there for over 250 years. It played an interesting part in the American War for Independence. Benjamin Franklin was invited to a party here by the Oliver family and during the evening he stole private letters which exposed the family as Loyalists to The Crown of England. The house is said to be haunted by a few ghosts, including a little girl and at least one dog. It was here, along the stone wall on the left hand side of Farm Street, that teenager Bill Bartlett saw the now famous Dover Demon while driving with two of his friends on the night of April 21,1977. Over the following 24 hours three other teenagers would encounter the same strange, little creature with large eyes and watermelon sized head. The case was investigated by Loren Coleman and he and his colleagues found the witnesses to be credible. As far as anyone knows the thing has never been seen again. About two hours after the first sighting, 15 year old John Baxter encountered the Dover Demon approximately 8oo yards up this street while walking home from his girlfriend's house. When he got home and told his parents about what had happened to him, Baxter did the same thing Bartlett did, he drew a picture of it. Later when the two pictures were compared it became clear that they had both seen the same creature. Just like Bartlett, Baxter was quite frightened by the odd features and manner of this unknown entity. On the night of April 22, around midnight, a young couple named Will Taintor and Abby Brabham saw the Demon standing above the culvert on Springdale Ave. Brabham got a better look at it than Taintor, but both agreed it must have been the same thing the other two boys had seen earlier. To this day, none of the witnesses have ever recanted their stories.
. The location of the third sighting by Brabham and Taintor. Now a Masonic Lodge, this mansion was once the home of the Houghton family whose lives were broken by a tragic automobile accident in 1914. The building is believed to be haunted by A. C. Houghton, his daughter Mary, their driver John Widders and an unidentified little girl who is seen in the basement. The mansion's basement is just one of the many hot spots for paranormal activity. Little points of light are seen here, like sparks in the dark. A little girl has been glimpsed in silhouette darting by an open doorway. Below: This is believed to have been the room of John Widders, the Houghton family's "right-hand man." Widders felt responsible for the car accident that took Mary Houghton's life and committed suicide the following day. Above: John Stone himself. A tintype photograph of a young girl was found inside the backing, behind Stone's picture. Is she the little girl who is said to haunt the tavern? What was her relationship to this rough and tough tavern owner? Right: This little girl's apron was found in the attic and looks to have blood stains on it. Test have been run on the stains to determine what they really are. G.P.R. will post an update when more is learned. This summer cottage from the Gilded Age is haunted by the sounds of footsteps and banging doors. The smell of perfume has been detected without any logical source and then it is gone without a trace. Some very interesting EVPs have also been captured here. This beautiful Victorian home was built by Elisha Murdock between 1820 and 1830. Later additions and renovations were made in 1901. Ownership passed to the Murdock's son-in-law, William W. Whitney, in 1889. Today it is the headquarters for the Winchendon Historical Society. The house is said to be haunted by a lady in white who floats about the second floor. 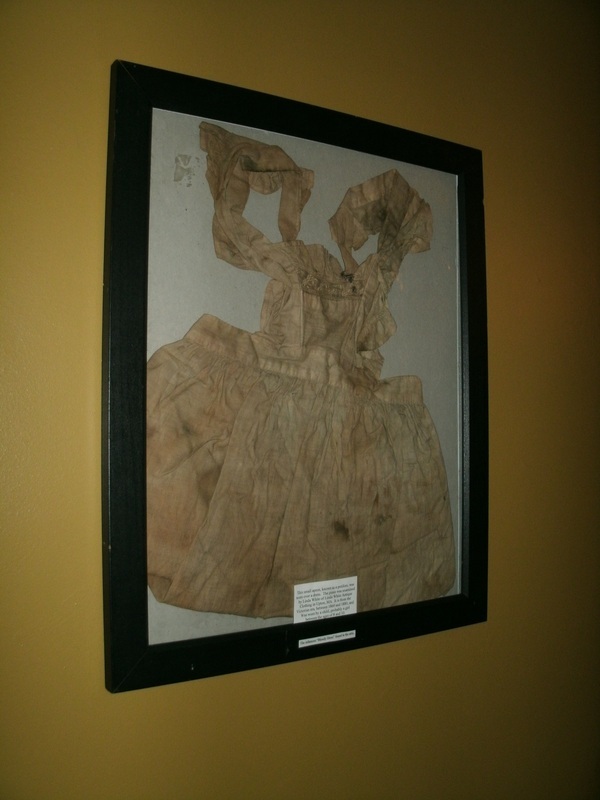 This white wraith also makes appearances in a front corner bedroom. Some folks who used to live in the house (when it was rented out as apartments) say there maybe more than one spirit in the old home. A young boy named George died here and his spirit could explain the activity on the third floor which has many old toys on display. After all, Winchendon, MA, is known as, "Toy Town." The second floor hallway and corner bedroom where the ghost of a woman, possibly the spirit of Mrs. Elisha Murdock, is said to haunt. This small settlement was started by Obadiah Higginbotham and Jon Randall around 1790 and they and their families made a good life here. By the late nineteenth century the homes and mill were empty and today only stone walls and cellar holes remain. Legend has it that ghosts and strange sounds have haunted these woods since the early days of the settlement. In 1927, Odell Shepard wrote about this strange spot and it's phantom sounds of farm life and paranormal investigator Paul Eno has recorded his amazing experiences at the site in 1971. The land is private property and trespassing is not allowed. This land was given as a reward to the Connecticut volunteers who fought the Narragansett Indians in King Phillip's War. However, during the war, a group of white soldiers hunted down and killed a Narragansett warrior and his family who were hiding in these woods. The legend says that the warrior's wife fled from the brutal assault, but was soon found by the soldiers hiding near a small stream. Her uncontrollable crying gave her away. She met with the same sad fate as her husband and children. After the war, former soldiers and their families began building homes here and cleared the land for farming. None of them stayed for very long though. It is said that the settlers were driven off by the haunting sound of a woman crying. 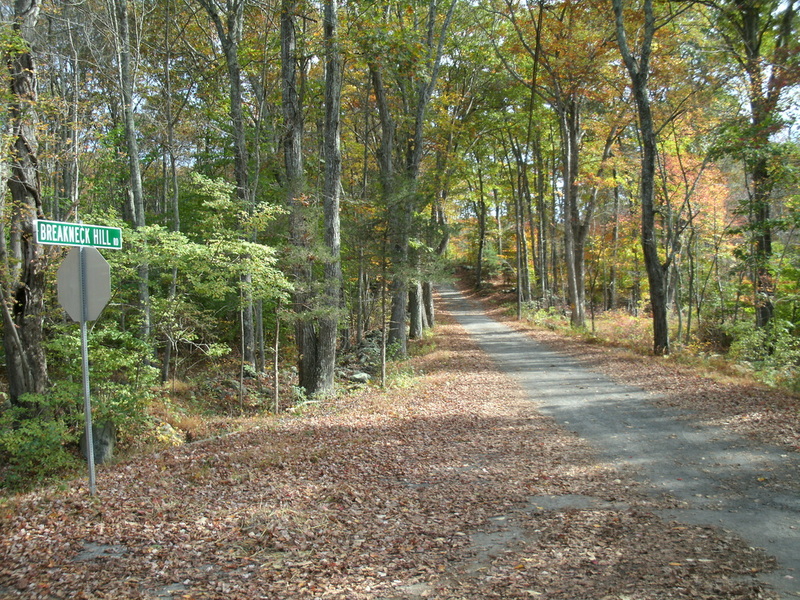 Over the years, the ghost of a Colonial-era soldier has been seen along this old carriage road. 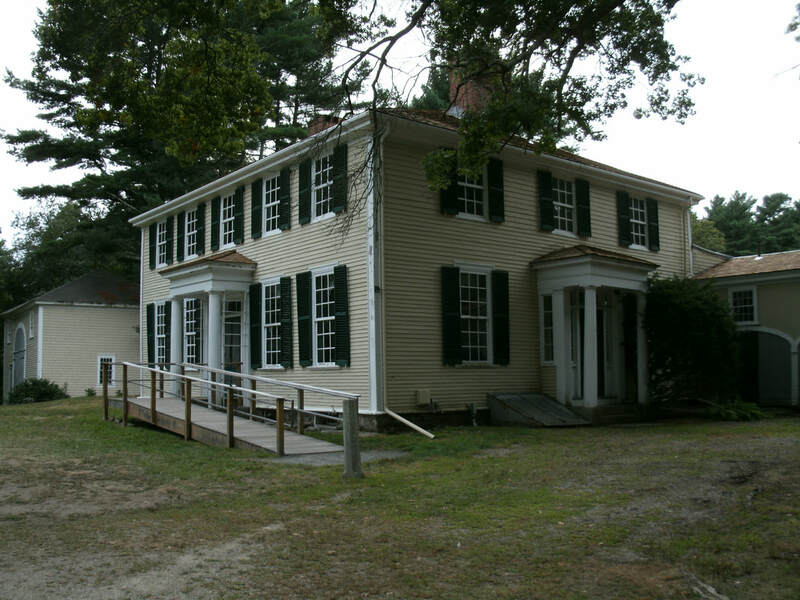 Since it's construction in 1741, this house has served as a post road tavern, B&B and private residence. George Washington supposedly slept here. At the time of this writing (Oct. 2008) it is uninhabited while it's current owners perform much needed restoration. There have been two known deaths in this old house. One, a revolutionary war soldier who was stabbed in the north west room by a fellow soldier in a fight over a woman. The killer took his own life later in an undisclosed location. The other death was a drunken man who broke his neck falling down a steep set of stairs to his second floor room. It is said the blood stained floor boards in the north west room were turned over to hide the grisly reminder of the soldier's murder. No evidence could be found by our team in the cellar below, past restoration may be the reason why. The current owners know of no recent paranormal activity. The steep stairs where the drunken man fell to his death. It is not known what caused the strange translucent streak in this photograph. The camera used was a 35mm automatic using 800 speed film. Houghton family plot weighs about four thousand pounds. What is so strange about that? Since 1930 it has rotated more than two feet on it's base. How? Well in 1971 four students from Connecticut State University tried to answer that question and every answer they came up with just didn't pan out. Since then, no one has been able to explain the unrest of this dark sphere. This unpolished spot and hole is the original bottom of the sphere. "I only regret that I have but one life to loose for my country." So declared the twenty one year old Patriot, Captain Nathan Hale, before the British hanged him for espionage in a time of war. Nathan grew up in the original home that stood a few yards to the left of this larger house. Nathan is not believed to haunt the Hale home. But others from its past do. A man named George Dudley Seymore bought the tired old building in 1914 and made it a labor of love to restore the mansion. The docents for the property say it is Nathaniel's father, Richard who is the male ghost in the house. Mr. Hale made an appearance in which he frightened a boy who was misbehaving during a tour of the homestead with his father. The boy had run off through the first floor of the house, making a rude fuss. He then quickly returned to his father's side, frightened by a man he saw in the Judgment Room. The child insisted it was not the portrait on the wall he saw, but the same man standing on the other side of the room, looking right at him. The father apologized and left the museum with his young son, leaving the staff a little spooked. A young girl who worked for the Hale family and lived above the kitchen is thought to be another of the home's ghosts. Other note worthy moments; a staff member heard someone sobbing as she was locking up one night and a strange, unexplainable light was seen in the attic by staff and their family after closing. This charming house was built by Captain William Gonzales Grant for his family in 1754. He died at sea and is buried in the cemetery across the street. It has been an award winning B&B for many years and is also found on the National Register of Historic Places. It is very haunted. The spirits that roam the halls and attic are felt to be the Grant family. One of the most extraordinary moments experienced by guests was when two folks who were lounging downstairs saw a heavy stone chess piece float off of the board and drop to the floor, twice! This doll is actually a sand filled weight used as a door stop in the Adelaide Room. It has a strange habit of disappearing and then showing up in the weirdest spots around the inn. Other objects in this room have done the same, including a bottle of window cleaner that went missing in the blink of an eye and then turned up weeks latter in the middle of the floor in one of the other rooms. It is believed the ghost of a little girl is responsible. An employee, who did not believe in ghosts, had a close encounter with her in this room. She needed a few days off and afterwards returned to work with a new perspective on life after death. This historic cemetery lies in a patch of woods out in back of Captain Grant's. It is reported to be haunted. Many of the graves contain the remains of children. Above: A cellar hole along Dark Entry Road. Above: Dark Entry Road is one of two roads which lead into the lost village of Dudleytown. This little town thrived for nearly one hundred years before bad luck and madness brought about its demise. Author Jeff Belanger has done some research into the curse of Dudleytown and says the legend doesn't fit with known historical facts. But facts haven't stopped the stories about ghosts and negative forces said to haunt this abandoned place. As of this writing (8-01-10) there are homes being built along the two old lanes going into the forest. Both roads are narrow and very steep. The forest is also private property and the good people of Cornwall do not care for legend trippers looking for the old ghost town. 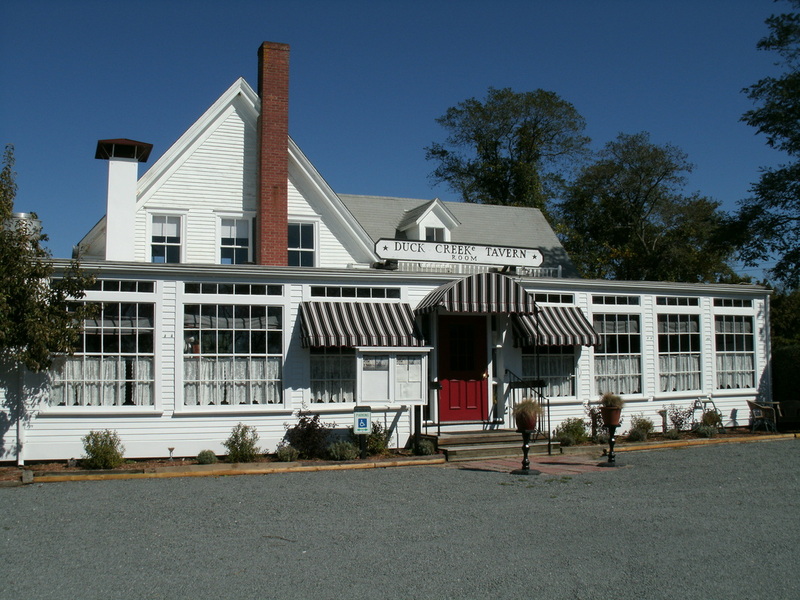 The former Pettibone Tavern is now called Abigail's Grille & Bar. Abigail is the nickname given to the female ghost that haunts this old stagecoach tavern. Right: The ghost has been seen on these stairs as well as in the kitchen area on more than a few occasions. The upstairs bar and the front lobby have_ also seen a fair share of ghostly activity . 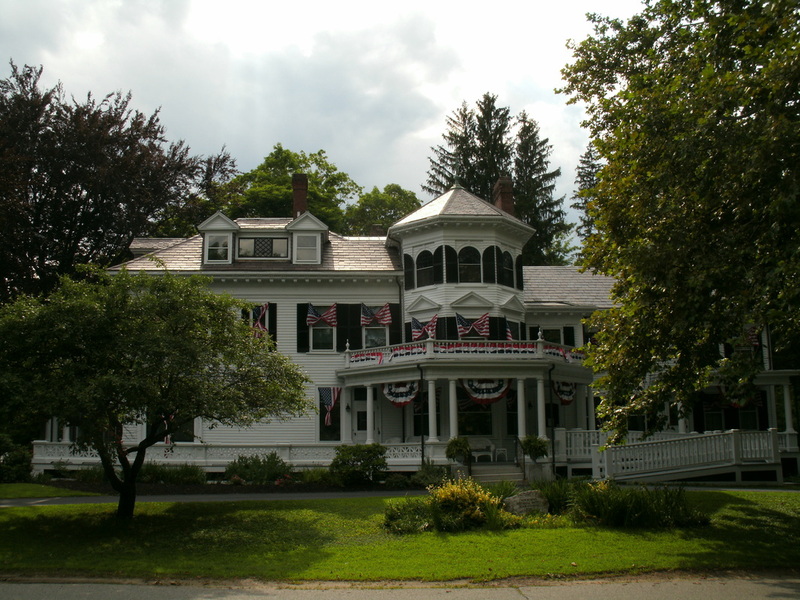 Above: The Boothe family's home has played host to many paranormal happenings over the years such as footsteps, voices, unexplained sounds and a man in black carrying a lantern. Left: The Anniversary Clock Tower. The mysterious man in black has also been seen with his lantern on the upper observation deck. Haunted by Susy Clemens (Mark Twain's daughter), some happy little children and a former employee of the Clemens family. Originally built for Dr. Dudley Woodbridge and his wife Sarah to spend their retirement in, this home is now an inn for romantic getaways. Over the years guest have reported seeing the apparitions of a woman and a young boy, objects moving in their room and hearing footsteps on the stairs. For many years motorists have seen a woman in white walk from this cemetery and cross Route 59, which runs right by the church and its graveyard. Ghost hunters Ed and Lorraine Warren captured the ghost's image on video in 1990. Police take notice of this location. Right: Voices have been heard in the home's cellar speaking a language that witnesses were not able to identify. 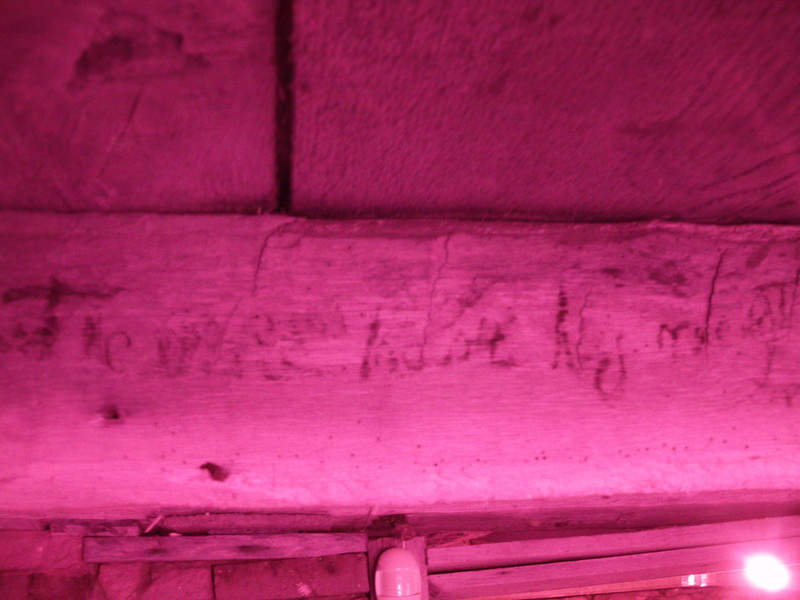 This picture was taken in the UV to IR spectrum to help show up messages on a beam which were written by Hessian soldiers who were kept here as prisoners during the American Revolution. Their meaning has not yet been clearly deciphered because these words are from an old German dialect. Haunted by a hammering ghost nick-named "Benny" and a blue lady that has been seen at an upstairs window. The former site of old Quarryville is today a state park. The railway line which once ran through the notch has been made into a public walking trail. There have been reports over the years that a phantom cloud travels along this trail which has the appearance of smoke and steam billowing from a train's stack. The ghosts of quarrymen, a Dutch settler and a slain native American sachem are also said to haunt these woods and the cliffs above the notch. Many of the old utility poles that once ran power and phone lines into the notch are still standing. 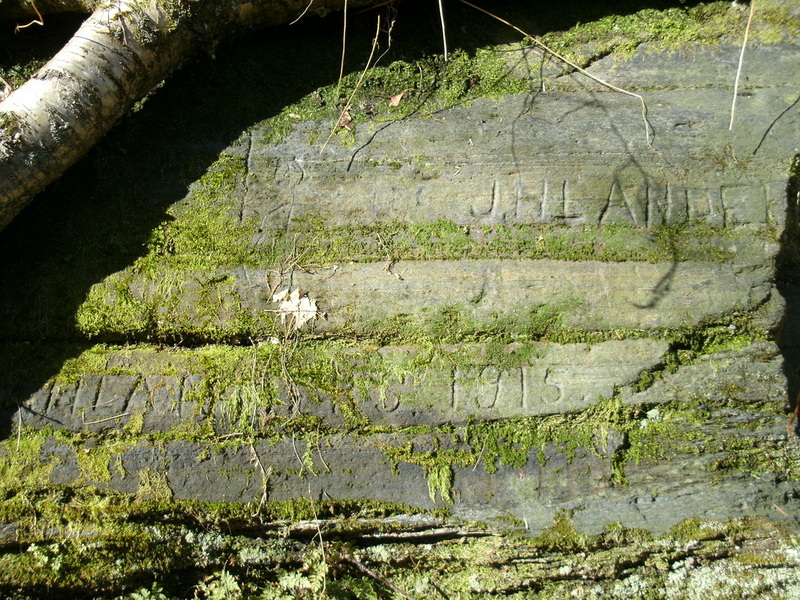 Faint carvings can be seen at the base of the cliffs along the old railway line. Anyone who loves America (and history) should take a trip here and pay respect to this solemn, historic site. A place marked by passion and blood, Gettysburg is a hot spot for all types of hauntings. This sinister rock formation was the focal point of horrendous combat between Union artillery and Confederate infantry. After the Union men lost the fight and had to retreat, Confederate sharpshooters used this location to snipe Union soldiers on Little Round Top. Many people have encountered phantoms and life-like ghosts around and about these rocks. The sickening smell of blood has also been reported. A local paranormal research group has a photo taken in daylight with an infrared filter that shows two ghostly soldiers in action at this spot in the rocks. Union Major General John Reynolds was killed here on the first day of fighting while encouraging his men to press an attack against Confederate infantry in the woods. Witnesses have seen ghostly forms moving about this spot. The only civilian casualty in the three days of fighting was Jennie Wade. A rifle shot cut through the kitchen door and struck her while she was baking bread. It is not sure if it is she or her mentally deranged father who haunts this historic home. Visitors to the house have taken photographs that have shown orbs and other strange anomalies. Two thousand years of history has left this fantastic city with many haunted spots. Here are just a few! This is arguably London's most haunted location. The list of ghosts that have been seen here is like a "who's who" of British history. Anne Boleyn is said to walk the White Tower, Tower Green, the King's House and her final resting place, St. Peter-ad-Vincula. The Bloody Tower holds the spirits of the two murdered Princes, Edward V and his brother Richard. Others include Sir Walter Raleigh, Lady Salisbury and Lady Jane Grey. There has been a prison on this site in Clerkenwell since 1616. In 1844, a Victorian house of detention was erected here that saw thousands of London's riff raff through it's gates before closing down in 1890. The above ground buildings were torn down, but the underground passageways and cells survived the demolition. They were unused until the Great Blitz (as a bomb shelter) and then afterwords forgotten again. It was opened to the public as a museum in 1993, but was closed down in 2001 due to ownership problems. There has been talk about getting it opened back up again for ghost tours. Reports of the paranormal have been about shadow ghosts, an old woman who seems to be looking for something and the sad cries of a little girl. During the days of Wellington's army, this beautiful pub and restaurant was an officer's club for the Grenadier Guards. An officer, believed to have been cheating at cards, was beaten to death in the old inn's cellar. Another story has him being flogged in a nearby courtyard with death resulting. Many feel he was not guilty of this crime. Over the years, officers have sent the pub payment for the alleged debt of the accused and the money is then affixed to the dining room ceiling. Not only does the ghost move glasses and other objects on the bar, he is also seen on the stairs and in the upstairs bedrooms. The sound of footsteps and the ghostly form of Rahere, the monk who founded St. Bartholomew's Hospital, have been perceived by many visitors and church staff. This attractive little town is well worth a visit. However, be on the lookout for a terrifying black cloud that assaults anyone who passes through it. It has been encountered on the road just outside the town. Some people think it might be the evil spirit of a highwayman who was caught and hung nearby. The priory and old rectory located on the far side of the town (not open to the public) are both very haunted. An old-time gamekeeper and brown monk have been seen on the grounds and a phantom bell rings at 2:00 a.m.. This beautiful little chapel sits about a mile outside the town of Thame. It is haunted by a Tudor Lady. She is seen walking around the grounds by the giant yew tree. On the A418, less than two miles outside of Thame (heading to Aylesbury), you will find a right turn to the village of Haddenham. The ghost of a murdered farmer has been seen at this intersection many times since his death in 1828. In the village, there is a private residence with a ghost that is heard in the early morning hours, walking along a hall in the home's 15th century wing. Greenville Paranormal Research was good friends with the former owners, now sadly deceased. This fourteenth century inn is said to be haunted by a woman in white. She is thought to be a former employee, a young woman named Susan who fell victim to a bad joke gone very wrong. Some local boys made her believe a handsome, successful young man was waiting for her at the nearby chalk caves. She arrived wearing a wedding dress as she was told, but her dream man was not there. Instead she was met by the cruel boys, who laughed at her heartbreak and disappointment. Susan began throwing rocks at them and they too threw stones back. One struck her head and she was seriously injured. Susan died soon after in a room at the inn. Some say she haunts the chalk caves of the infamous "Hell Fire Club" as well. This 14th century moated manner-house is haunted by the ghost of Dorothy Selby. She is thought to be the person who sent an anonymous note to Lord Monteagle informing him of the infamous "Gunpowder Plot" of 1605. At the tail end of the 19th century, workers found a woman's skeleton in a secret walled-up room. It is believed to be the remains of the missing lady, put there by members of the plot to blow up the Houses of Parliament. The ghost has never been seen, only felt as an extreme cold spot that can not be explained. There are three ghosts haunting this picturesque castle. A scullion has been seen in the kitchen from time to time. The ghost of a young, brokenhearted woman who leapt from Hiorne's Tower and the Blue Man, a ghostly Cavalier, who is seen in the library. A headless drummer makes an appearance here at the castle whenever Scotland is in dark times.